Muslims in France are a losing proposition. The French should obtain several very large vessels, build mosques on them, then slowly round up all Muslims, and sail them back to their points of origin. Because Muslims will take, but will never contribute to the betterment of the French or ANY civilized society. If you haven’t heard of Clichy yet, you likely soon will. The town of 60,000 inhabitants, minutes north of Central Paris, is the latest flashpoint between the secular French Republic and its burgeoning Islamic population, members of which were involved in a tense stand-off with police Wednesday morning over the closure of a temporary mosque. The mood was extremely taut during the police operation which saw members of the mosque removed from the building, the doors of which were later soldered shut. As news of the eviction spread, crowds re-assembled in front Clichy’s town hall to demand a meeting with the mayor, their protest overflowing onto the main thoroughfare, Boulevard Jean Jaurès, blocking afternoon traffic. The short-term lease of a public building had been agreed with local Islamic associations in 2013 by Clichy’s then socialist mayor. Three years later, in 2015, the newly elected center-right mayor announced the termination of the lease for the opening of a planned media library, setting the stage for the legal wranglings culminating in this week’s eviction. 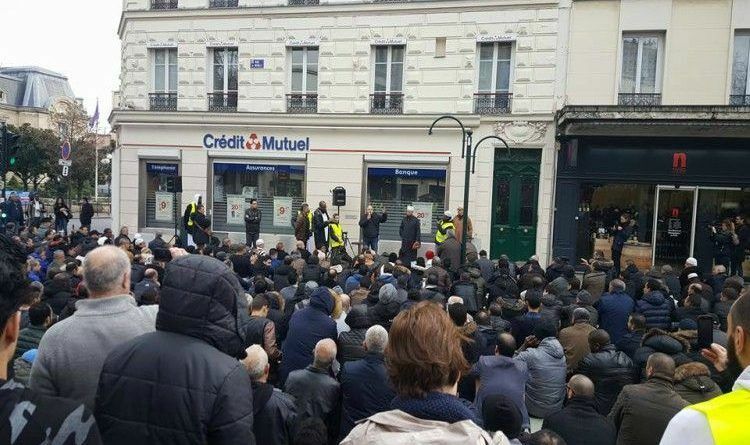 In extraordinary scenes – particularly for a country in a state of emergency after two years of Islamist terrorism – police looked on as defiant chants of ‘Allahu Akbar’ were heard in front of the town hall and traffic was blocked by over a hundred members and supporters of the mosque staging a sit-down protest in the middle of busy Boulevard Jean Jaurès. As the surreal afternoon unfolded, sixty or so kneeling men were led in prayer by a local imam, whilst a line of veiled women with children – some holding signs – formed a buffer behind them against the growing backlog of traffic. The rising cacophony of honking emanating from frustrated drivers stuck in traffic behind the protest failed to obscure the words in Arabic spoken during the invocation of prayers. Onlookers, many of them Muslim, observed in respectful silence. Police, reinforced with a heavy presence of anti-riot CRS, stood back despite the outlawing of such street prayers several years ago, choosing instead to negotiate with community leaders who are demanding a longer-term formal lease on the building with a view towards its purchase. A replacement mosque in a newly opened Islamic cultural complex is too far from the center of town, protestors complained and lacks the space to accommodate Clichy’s growing Islamic population. Last November, during protests following the legal outcome that led to eviction, the president of the Union of Muslim Associations of Clichy, Hamid Kazed, expressed his desire for a suitable place of worship for Clichy’s 20,000 Muslims. The association is calling on members to return for street prayers every day at 4 pm until an agreement is reached. Crowds had increased in size, prayer mats in hand despite the wet weather. Although protests passed off without major incident, the sight of Islamic religious tradition in the streets of secular France, along with the chanting of ‘Allahu Akbar’ – increasingly heard prior to criminal and terroristic acts – will unsettle many and do nothing to reverse the increasing polarization of French society. In everything from the workplace to the gymnasium, from school canteens to hospital wards, there is a growing friction between the two divergent populations which is reshaping France and which will determine its future. Regardless of how this dispute is resolved at Clichy, the country can expect more to come as its Muslim population, conscious of its growing demographic weight, continues to assert itself. As for our country we have a simple solution! No violence necessary — simply give them incentives to leave. Cut off their welfare. And as noted, acknowledge legally that Islam is a totalitarian political system that by its very nature is seditious of Western democracies; ban its practice. As you may know, even now Canada is collapsing as a free country owing to the recent imposition of blasphemy laws aimed at criminalizing criticism of Islam. This is exactly what I mean by *sedition. * As Geert Wilders says: the more Islam in a country the less freedom. And these people mean business about subjugating the planet to their rule; get them out before it’s too late. Also,Facebook has greatly reduced the distribution of our stories in our readers’ newsfeeds and is instead promoting mainstream media sources. When you share with your friends, however, you greatly help distribute our content. Please take a moment and consider sharing this article with your friends and family and on your Facebook wall or other social networks that you use! Thank you.